"I just keep wishing I could think of a way to show them that they don't own me. If I'm gonna die, I wanna still be me." Just as we thought we were almost rid of the Twilight phenomenon, in comes The Hunger Games, a raging, fiery teen juggernaut ready to annihilate all competition. And, you know what, I'm rooting for it. 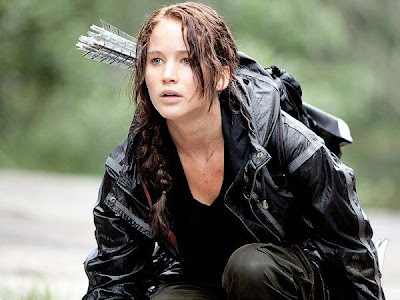 Dirty, metaphoric, and bravely smart (especially for its genre), The Hunger Games isn't merely a floppy teen sensation; it beckons for a turning point in the genre. It takes a very debased yet comforting sense of reality (i.e. our dependency on reality shows) and blends it with our fascination with violence to present a dark yet striking post-apocalyptic look at our future. And, more profoundly, it follows that from a teen's point of view. Jennifer Lawrence stars as sixteen-year-old hunter Katniss Everdeen, who lives with her mother and younger sister Primrose in a poor region called District 12. The movie takes place in the not-so-distant future and the districts face the yearly Hunger Games, a ritual headed by the far more lucrative region called the Capitol that calls for one boy and one girl from every region to fight to the death. Twenty-four compete; only one survives. So when Primrose is chosen to fight in the games, Katniss volunteers to go in her place to protect her sister. 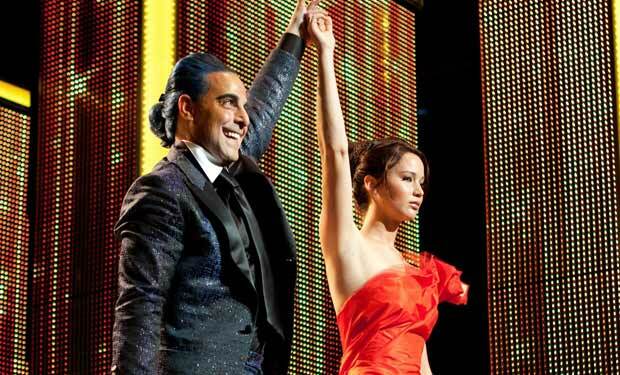 She, along with Peeta (Josh Hutcherson) from the same district reluctantly take the stage to accept their fate. It's a mighty bloodthirsty event, complete with fire balls and genetically-altered animals, that's become the norm in the country and has risen to Olympic proportions. It's even televised on the big screen for all to see, and hosted by the flamboyant Caesar Flickerman (Stanley Tucci). All the while, those in the ivory tower use the kids as pegs on a board game to manipulate the challenges and increase the entertainment value for their captive audience. As you watch the body count increase during the games, you might actually hear Russell Crowe from Gladiator shouting "Are you not entertained?" Or, maybe that was just me. Even though the movie generally centers on the two main characters of Katniss and Peeta as they fight to stay alive (and develop the inevitable romance), the rest of the colorful cast are equally as interesting to watch. You feel like each of them means something, and has a very distinct purpose which makes them more alluring to watch. It helps that the entire cast brings their A-Game to the movie. Everyone from Caesar to Haymitch Abernathy (the pitch-perfect Woody Harrelson as Katniss and Peeta's sponsor) to the corset-wearing Effie Trinket (Elizabeth Banks in, finally, an interesting role) and the quiet yet thoughtful Cinna (Lenny Kravitz, who's similar to a style director for the event) and the cherubic-faced Rue (another district contender played by Amandla Stenberg) is purposeful and well-developed. The film takes a very Dystopian view and brings it down to our level so we won't feel so far removed from it, which makes it that more frightening. But those who haven't read the popular novels by Suzanne Collins, on which the movie is based, may scratch their heads watching certain scenes. Much of Katniss' backstory is told in flashbacks, and often repeated throughout the movie, but you never quite get the impression you fully comprehend what they're telling us in the flashback. In other words, you feel there's more to the story than what they're giving you in this first movie. More than likely more will be explained in the subsequent sequels, but since the movie ran well over two hours, it would have been wise to spend a little more time capturing that very important backstory (even if it were only for a few minutes). But, the way it's done makes you yearn for sequels, while also sparking an interest in reading the books. Aside from Katniss' story, we're also left wondering why Cinna dresses so normally while the rest of the folks at the Capitol are decked out in their Ringling Brothers' best. Also, the relationship between Katniss and her mother is quite jarring. They're clearly very distant and cold toward one another, with no explanation as to why that is in the movie. Though some of the references will escape you if aren't familiar with the books, The Hunger Games is an provocative story that intensifies by the minute and whets your appetite for more. It does its job by making you want to pick up every book and read it twice, as you bite your nails waiting for the next movie. A definite must-see. You'll be on the edge of your seat the entire time. I thought the performances really made the film. I've read the books and I was still on the edge of my seat. This was a good start to the series. Thanks for the review. great review! 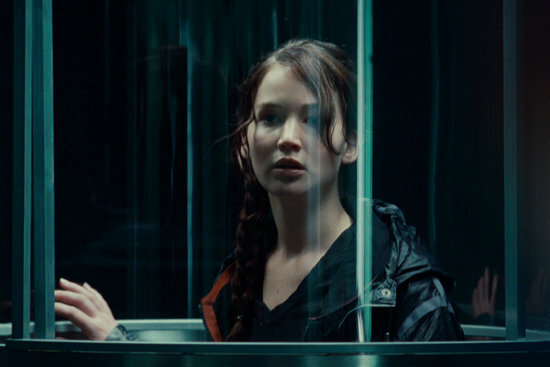 i 've read the books and i really enjoyed seeing the interpretation of katniss's world on screen. i did wonder how it would strike on who hadn't read the books, though. This was a movie that I could have sat through more of, because i really wanted more backstory, much more of Rue, and my teenagers definitely wanted more of Katniss and Peeta in the cave. But I did enjoy it anyway, and the music was haunting. I'll be honest, I really didn't expect to enjoy this. Watched it simply because of the buzz and was incredibly impressed with how the subject matter was treated and how well the cast performed. Candice, your enthusiasm for Hunger Games really came through in your write-up! I haven't read the books so seeing the movie was first intro and enjoyed it! Looking forward to what happens next! The movie was awesome but read the books too, like I said before you'll get hooked on them. I wish that I hadn't read the books before the movie though cause it was a bit confusing, particularly because it's harder to point out those flaws you mention. I understood all the back stories and thought the movie did justice to them but yeah to people who haven't read it it might be a bit of a head scratcher. I just picked up the books today. I enjoyed the movie, but I had a lot of questions. I hope they're just as good. Great review. I read all 3 books and I think they did a great job with the movie. It is always hard to adapt a book to the screen, especially when The Hunger Games is told mostly from Katniss' viewpoint. The next 2 installments with take this young adult genre away from sappy teenage love angst to something totally different. I think that is why The Hunger Games was so popular with both teenagers and adults. It shows a young girl as the hero, not helpless and love sick. I really enjoyed your review, Candice, although I haven't seen the movie. I took my daughters and their friends last week, though, and their enthusiasm (and, now, yours) is starting to entice me to read the books and then see the film.